What you eat will show on your face and body: it will impact on the way you carry yourself, the amount of energy you have, and your level of passion for life! You are what you eat and that’s a fact. Take advantage of this herb that grows prolifically, just about anywhere. If you don’t have a garden, it will grow in a pot on your balcony. The great thing about basil is that it adds sweetness to your meal and has none of the downside effects of sugar e.g. mood swings, weight gain, addiction, and (yes) acne. In fact, Basil can be used to treat acne; just add boiling water to a bunch of leaves and flowers. Allow to cool, strain and apply directly to the skin. Try and eat basil as raw as possible: basil grown in strong sun will have the best and most intense flavour and perfume. 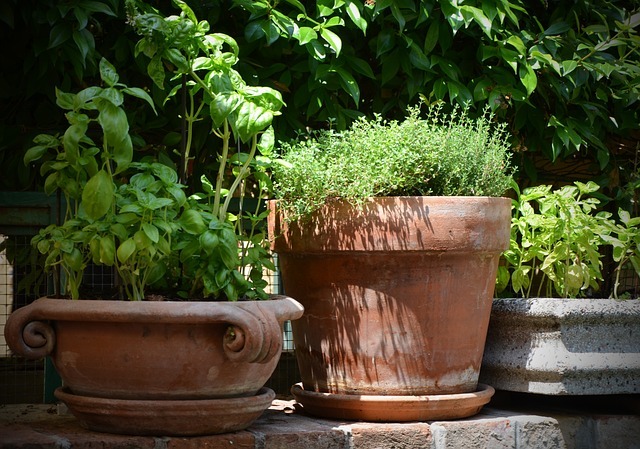 Basil must be handled carefully: it is preferable to tear the leaves as cutting can produce a strong aniseed flavour. Purple basil (if you can find it…) with its intense flavour and beautiful colour is wonderful in salads as well as mixed with grilled vegetables. Medicinal qualities include helping with nausea and stomach disorders. Basil juice can be used to treat insect stings and cuts. Basil is particularly good in treating symptoms relating to nervous disorders. Fenugreek is a plant that is native to southeast Europe and west Asia. Its seeds are often used in Middle Eastern or North African dishes. The slight bitter taste of this spice enhances the many flavours that are used in Eastern cooking. Fenugreek is famous for its medicinal qualities. For centuries, Egyptians, Greeks and Romans have used fenugreek to treat various disorders. It can improve cholesterol levels and help stabilise blood sugar in diabetics. Fenugreek can also aid digestion. Occasionally it can cause diarrhoea, depending on the constitution of the patient, so doses need to be monitored. Decreasing your dose should alleviate this side effect. In addition to seeds and capsules, fenugreek also comes in powder and gum forms. Ginger is thought to have originated in South-East Asia. Its hot, spicy and clean flavours have become popular in many cultures over the centuries. In ancient times it was a highly prized Eastern import to the Roman Empire, where it was used mostly for medicinal purposes. In medieval England, ginger was used as a condiment and was as common as pepper. It was also eaten as a ‘sweet’ in a preserved or glace form. Ginger has been used predominantly in the Middle East, Africa and South America but where it has really flourished has been in Asian cuisine. Eaten sliced, juiced, grated, ground, minced or mashed, or preserved in vinegar or sugar, ginger has become the quintessential spice. Ginger has been used in Chinese herbal medicine for centuries to purge the body of colds and viruses and as a stimulating tonic for digestive disorders and the female reproductive system. Allowed to steep in tea, it induces sweating, which helps fevers run their course. It also tones and helps boost the immune system. Ginger is also helpful in the treatment of period pains, digestive disorders, nausea and colds. It has been known to successfully treat travel sickness and nausea in pregnancy; used instead of traditional medication. Its revitalising qualities lift the spirits and ease depression. It is one of the most pungent of vegetables and also the most popular. The powerful bite and odour of garlic are caused by a reaction between sulphur compounds and enzymes which are activated by the air when the bulbs are crushed or cut. Garlic is integral to nearly all stocks, soups and stews. It is credited with medicinal qualities as well as its versatility in cooking, for which it is well known. Used whole, chopped or crushed, raw, sautéed or roasted, garlic has a distinctive flavour (not for the fainthearted…) that can vary from pungent to sweet. Garlic grows underground as a bulb consisting of many cloves, each of which is encased in a papery skin. The smell of garlic only emerges once the cloves are cut, causing damage to the cell walls. The more you cut the cloves, the stronger the smell. Cooking the garlic, however, destroys the compound, rendering it milder and sweeter. When choosing a head of garlic, make sure it is firm and dry, with no discolouration. Most of the modern research on garlic has concentrated on its ability to lower cholesterol and blood pressure as well as offering protection against strokes and heart disease. While garlic is gathering a reputation for helping to maintain a healthy heart, regular amounts of garlic seem to also help the body fight off infections. youarewhatyoueat.tv You Are What You Eat promotes healthy eating: high quality food is one of the easiest and most effective ways to promote and improve physical well-being. By thinking more carefully about what you eat and making healthier food choices, you can get the very best out of your life. Whatever your size, what you eat is crucial to the way you live, look and feel.